5 Fandom Fridays was a thing I used to do for a bloggers group I am a part of. That is no longer happening, but I decided to do my own thing! In my Fandom Friday's, I share about a thing I am currently enjoying. 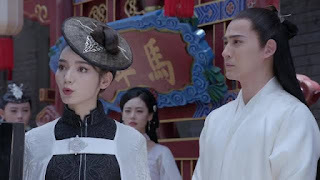 This is not a feminist drama, and it is not supposed to be (given it's a historical drama), but the little bits of feminism are one reason I like it. Without it being the purpose, this drama tells stories of badass women living their lives in a context of betrayal, assassinations, and family secrets, and the men who love them. 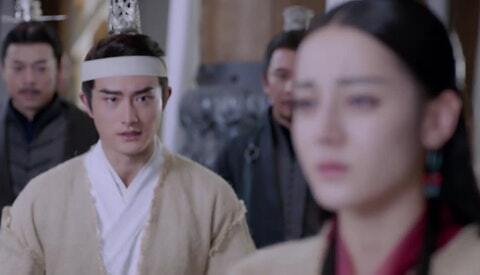 One of these women is Dao Lie Xiang, the daughter of the Top Blade City sect (one of multiple sects in this setting). When we meet Dao Lie Xiang, she has accompanied her brothers into the city's most famous brothel. While there, she stands up for herself as she gets comments from the women working in the brothel about how improper it is for a lady to be there. Not too long after, she stands up for herself and states that if men are allowed to buy women, then women should be allowed to buy men, and makes an offer to buy a husband. This earns her some harsh judgmental comments from some of the men present, but does she care? Absolutely not! Dao Lie Xiang. Image from trakt.tv. 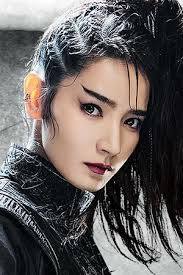 Every time Dao Lie Xiang was on screen in the first few episodes, she totally stole the show. It is likely also the actress portraying her. If you've watched other recent Chinese dramas you'll recognize her from Three Lives, Three Worlds, Ten Miles of Peach Blossoms (Eternal Love). In fact, you would recognize many other actors from TMOPB. It's probably also Miss Dao's killer style. Sadly, she has not been on screen much lately, but her character is probably the only female player who in her own way demands to be treated more or less equal to the men. The chemistry between Dao Lie Xiang and Lei Jing Hong is another enjoyable aspect of this drama. Though they are from different sects, they develop a friendship from temporary forced cohabitation (a common trope in dramas). Their bickering and shenanigans was more fun to watch than the initial relationship between the main leads. Despite their overt behavior and despite coming from shady families, both of them are good people at heart. The fact that they actually developed a friendship first before realizing they feel deeper affection for each other already sets their relationship apart. Usually in these dramas, the characters fall in love just because. With these two, you actually see this develop and it isn't just something that is taken for granted. Although initially they were more comic relief characters, their frenemy-friendship-romance is definitely something that keeps your interest, even though it does not (yet) get much screen time. To be honest, I think those two have better chemistry than the main pairings, but that's just my opinion. I also think I have seen spoilers about what happens to them, and rather than sharing them, I'll just keep them to myself. Regardless of what happens, these are two people you just root for. You can't have a list about the cool things about a martial arts drama without including the martial arts. The scenes between more or less equal opponents are great because that means they last longer and get more complicated. Even though the do not occur in every episode, or even every other episode, when they do happen they do not disappoint (unless you have certain expectations of these scenes). The settings of these scenes make them more exciting to watch, as they are usually beautiful backgrounds to some really cool choreography. There are other films and dramas that probably have better scenes, and I'm not a wire fu/martial arts aficionado. In many films and dramas, what we'll often see is that while fighting each other, one or both characters does/do the monologue/dialogue. This doesn't happen as much in most of these scenes in The Flame's Daughter (as far as I have seen). When there is dialogue, it is often spoken before or after, it is brief, and the focus is more on the battle. There is a lot of hand to hand combat, a lot of flowing hair and robes, and overall it looks beautiful. I'm a sucker for betrayal in dramas, just as long as there is redemption. Maybe it's because I grew up watching Mexican novelas and I get easily hooked on the evil twin/switched at birth/secret heir type of stuff. Whatever the reason there is plenty of betrayal in this show. There is more betrayal than romance. Considering the entire story is based on an initial betrayal, this is not surprising. Every episode there is something new to figure out, some new scheme that has begun, or some move that a character might make that can completely change the landscape. looking forward to this guy's character death x_x. Image from dramafever.com. Part of that is that this is all happening amidst a backdrop of Japanese invasions (and I don't know enough about Chinese or Japanese history to know the significance this might have). I think there is more there politically that is happening than I can understand, and it also makes me wonder how much is lost in translation. Maybe as I watch more Chinese dramas I'll become more acquainted with the significance of this in the storytelling. Despite all the betrayal going on, the main female lead does not tend to be easily fooled, though at times she might play along in order to observe and collect information that might help her regain the upper hand. I have to say this is one of my favorite things too, because even though I love a good betrayal storyline, I love even more when the heroine or hero is intelligent enough to see right through it. 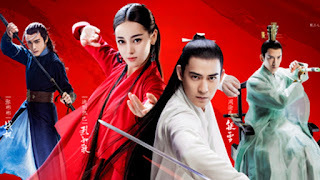 Have you watched this drama? What are your top three/five/ten favorite things about it? Do you have other Asian dramas you would recommend? Share your thoughts!